[vc_row][vc_column width=”1/1″ el_class=”portfolio-content” style=”default”][vc_column_text]So Knoll Light Factory 3 was just released today and I got a chance to test drive this legendary lens flare machine thanks to Aharon Rabinowitz. So what’s new and added in the ‘so longed’ industry standard lens flare plugin? Let’s find out. The most noticeable change is the new and improved visual interface. The Lens Designer interface looks a whole lot like the Magic Bullet interface, giving you a very fast and organized workflow for selecting professional presets, modifying lens flares, and creating your own flares. The new interface is a huge improvement from the older UI and it makes you feel very comfortable if you’re used to the Magic Bullet Suite. See Harry Frank’s tutorial covering the Lens Designer here. Did I mention some of the lens flare presets were designed by John Knoll from ILM? There are also a ton of new flare elements and sprites for your creative disposal to build your lens flares the way you want it. 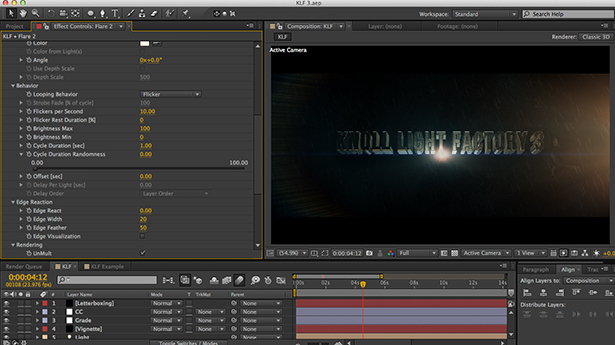 KLF 3 also makes it easier to add dynamic variation to your lens flares, something that lacked in previous versions. You now have a refined “Edge Reaction” which is like Dynamic Triggering in Optical Flares, but more controlled. You also have a new “Behaviors” tab which gives you tons of control over the animation of your flares ranging from flickers to strobes and pulses. You have complete control over these behaviors and can easily fine tune each aspect of the behaviors. Watch Harry Frank’s tutorial on Behaviors & Edge Reaction. KLF 3 is also smarter, it integrates with your 3D environment automatically and is fully integrated with the 3D camera within After Effects. You can also track 3D lights, using their position, brightness, etc. KLF 3 also has some pretty cool obscuration options allowing you to obscure your flares using a layer’s Luminance, RGB, Alpha, etc as well as control their Threshold. You really do have complete control over your flares now in KLF 3. Watch an overview tutorial of all these new features on RGTV. better than VCP one’s ? Visually, I think so. But Optical Flares is faster to use.